Sea kayaking with seakayakphoto.com: Oilean, 2nd edition, David Walsh, Pesda Press Review. Oilean, 2nd edition, David Walsh, Pesda Press Review. I have been reading David Walsh's Oileán –The Irish Islands Guide published by Pesda Press. It covers 574 Irish Islands that can be visited by kayak or small boat. David has an encyclopaedic knowledge of the islands having visited 503 of them! Since the first edition, this book has grown from 218 pages to 292 pages and the number of islands covered has risen from over 300 to over 570. It is therefore definitely worth buying, even though you have the first edition. This Irish volume differs from the Pesda sea kayaking Guides to the British coast. Its pages include fewer maps and most of the photos are smaller and so it contains a lot more text. Although the book is primarily about the islands, it contains essential tidal information for major mainland headlands and of course relevant tidal information required for island crossings. It also includes a great many launch points on the mainland. Unlike the other guides it makes few suggestions for recommended routes but where tidal conditions dictate David does suggest a preferred option. Although it has been written by a sea kayaker it would equally be of interest to anyone with a small seaworthy boat. For yachties it complements the existing pilots (which lack this book's detail on the islands) but for them, pilots are still necessary as this book does not cover anchorage information. It is designed to be read with the appropriate maps and full grid references are given for key locations. The concept of the book occurred in 1993 when David and Fred Cooney attempted to land on Davillaun island. They failed to find a landing spot and were later disappointed to discover that there was a hidden cove with easy landing. The core of the book is the description of the islands. Primarily this covers landing sites, camping possibilities, sources of drinking water and tides. Due to the comprehensive nature of this book and the sheer number of islands and launch sites I do not think there is any danger that it will create honeypot destinations which might suffer from undue numbers of visitors. If anything this guide will spread the load of increasing numbers of visitors to the islands which can only be good for both the islands and the visitors. It also includes fascinating insights into ownership of the islands and access (Ireland has no equivalent of the Scottish Land Reform Act). The book includes a wealth of historical information and describes the wildlife that may be encountered on and between the islands. The author has the gift of instilling the essence and character of each island into what may just be a paragraph for a smaller island. A book of this type could easily have ended up as a dry gazetteer but not so with David Walsh's excellent writing. He displays an eye for keen observation and writes in a lively style with dry wit. For example in describing one island's wealthy owners desire for privacy and their concern for the welfare of the nesting bird population, he goes onto describes their unsightly rubbish dump which is out of sight of their house. He then describes their precious nesting sea birds and the tradition of harvesting their eggs. "Apparently the birds all feed on municipal dumps across on the mainland and the eggs do not taste fishy at all." 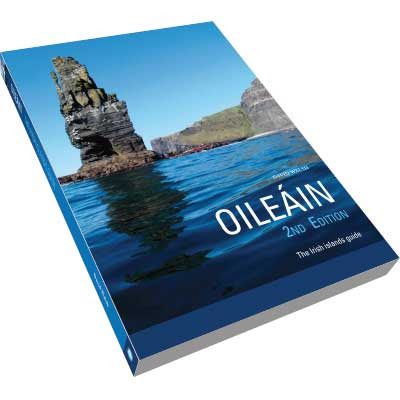 Oilean is highly readable, encyclopaedic and essential reading for those with an interest in the Irish islands. The book includes almost all of them. It even includes Rockall though I was somewhat disappointed to find no reference to Craggy Island. I must read it again!